Enjoy the Challenge of Longer Rides! Enter your name into the Great Book beside Charles Terront, PBP's first finisher. Brevets are longer, self-paced rides ridden by randonneurs (tr: ultratourists). A sequence of four brevets of increasing distance qualifies the to enter Paris-Brest-Paris, the oldest bicycling event on earth. 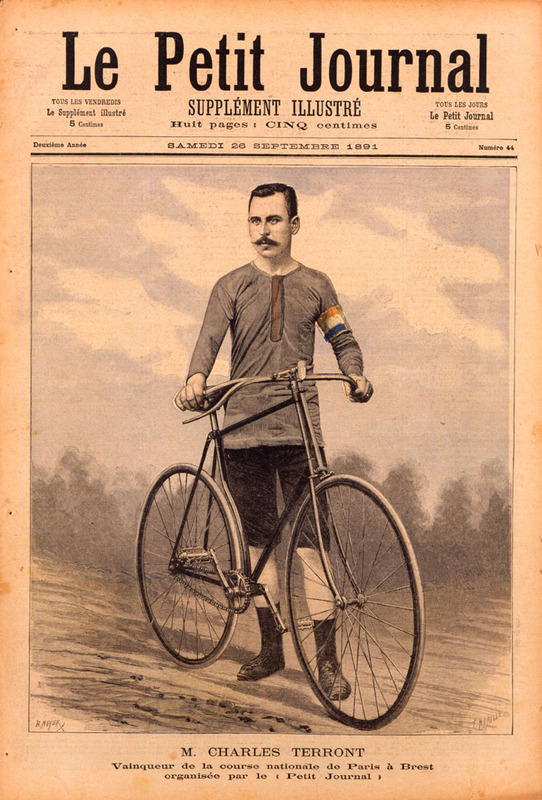 PBP was the inspiration for the Tour de France which began a year or so later. The upcoming PBP is scheduled for August, 2019, and so this year the Gainesville Cycling Club will hold a full four-ride qualifying series for this venerable event. Cue sheets are from earlier years. Final versions won't be available until the Tuesday before the event. Hard copy will be provided at check in, but presbyopic cyclists may want to print an enlarged version. Rumor has it the latest AcrobatReader has this capability. Once upon a time, PBP was the only 1200K event in the years when it was held. In off years, various surrogate rides were held in its stead. By 2011, PBP participation had grown so much that the event was nearly unmanagable, and alternative events were allowed in PBP years. Now you can choose from several 1200K rides that don't require foreign travel, but you'll be crazy not to try the real thing if you can. Brevets are not races; published results traditionally list the finishers alphabetically and may not even include their times. For example, you'll have to look toward the bottom of the final Boston-Montreal-Boston (2006) finisher list to find GCC's own Andrea "the Italian Stallion" Tosolini, who was only the second cyclist ever to complete the gruelling ride in less than 50 hours. Andrea was unable to convince the officials to sort by first names! However, there is a time limit. This limit includes the minutes spent eating, fixing flats, and on the longer rides, sleeping. All but the shortest brevet (200 km/125 miles) require some night riding, and good lighting is essential. Along the route, riders are required to stop at controls to get an authenticating stamp on their brevet cards. Each control has its own time window within which the authentication must occur to avoid disqualification. Riders should also anticipate one or more secret controls whose location won't be revealed in advance. Unlike traditional century rides which may feature rest stops every 20 miles or so, the Gainesville Cycling Club brevets are unsagged and minimally supported. Controls are mostly convenience stores, and riders who abandon will need to arrange their own transportation back to the start/finish. Randonneurs are a hardy lot. These rides will take place rain or shine, wind or cold, sleet or snow (although the last two are extremely rare in Florida). The course is not marked. Finding one's way is part of the fun. Getting lost is sometimes part of the experience. These events are sanctioned by Randonneurs USA and covered by their insurance. To use the brevet as a qualifier, Randonneurs USA membership is required before the ride. RUSA rules apply. Most notably, helmets are required. Membership in the Gainesville Cycling Club is not required, but GCC members benefit from a $5 discount for each event. Each rider must sign a waiver of liability before the ride start. Each rider must present their machine for bicycle inspection. Lights should be affixed, correctly aimed and working. Inspections and rider check in will be held from 6:30 to 7:30 PM the evening before the ride at the primary motel (See below) or after the ride start on the morning of the ride. By popular demand, we now accept credit-card payment via PayPal. You need not be a PayPal member, but they'll try to fool you into joining. Be careful, and you can evade conscription. To save $5 per ride, and get the benefits of Gainesville Cycling Club membership, prepare a club membership application before registering for a Brevet. Please preregister. If decide not to ride, just notify me before the start, and your registration fee will be refunded. We'll again use the Quality Inn, 2435 SW 13th Street, as our primary motel. We've negotiated a rate of $79/night (+tax = $88.10). To get this rate make make your reservation at least two weeks in advance, and mention the Gainesville Cycling Club. Reservations: (352)373-6500. Streetview, or for your GPS: 29.629502, -82.338769. Note: This is NOT the Quality Inn on I-75!